The H1700 Series provides easy access to digital input and output signals through an RS-232 or RS-485 communications link. The H1750 provides 24 channels of digital I/O, while the H1770 has 64 channels. For interfacing to realworld signals, the H1700 Series is designed to work directly with OMEGA solid state I/O modules. Modules are available to sense ac or dc voltages, or to control ac or dc power lines. 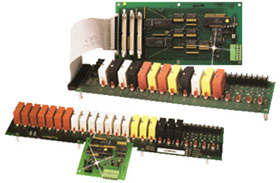 The H1750 mounts directly to the OMEGA SSS-PC-24V, which accepts up to 24 I/O modules, while the H1770 connects to up to four connects to up to four SSS-PC16-B 16-channel backplanes. 참고: Backplanes require solid state I/O modules. Each unit supplied with complete operator’s manual.